I'm having trouble creating the pattern of the rubber in the tyre for a car I'm building. Everyone seems to be posting rim tutorials, but not how to create the actual tyre. My tyre is a revolve or a spline profile. This presents me with some trouble, as SolidWorks refuses to project sketches across more than one face. 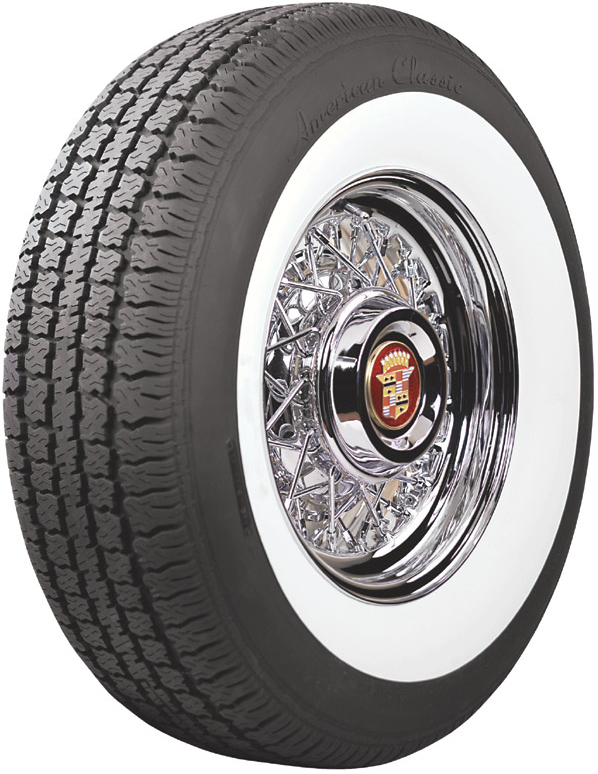 Can anyone give me some tips or show me some examples of how they build their tyres? 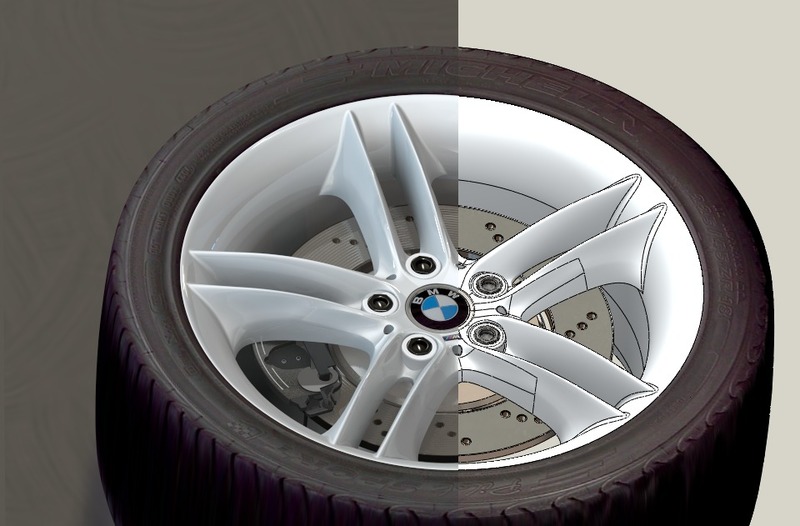 There is a Solidworks texture in Riubber>textures called tire. Just apply that. This is a texture as opposed to geometry. if you want geometry it is a lot harder. Not sure how I would try it as it depends on the tread profile. I'm going to render it in Maxwell, and I haven't found a displacement map texture in the style I want (classic 50's style). do you have a picture of the tread pattern you're trying to create? I can say that my problems arise when I want the groves to seamlessly blend into the sides of the tyre. Also, I can't seem to be allowed to pattern a circular pattern made out of sketches projected onto sketches. Basically, I've locked myself into bad thinking here, and need a fresh perspective. There's soooo many ways to skin that @#$@#$ cat with SolidWorks... and seemingly an equal number of ways of getting your eyes clawed out. One way is of course a texture or a decal and appropriate maping, or second way is solidworks feature and cut out material. Good practise is to use spline fit from menu tools > spline tools for sketch to revolve boss feature (for main tyre body), then you can during cut feature use offset from surface (because is only one face). 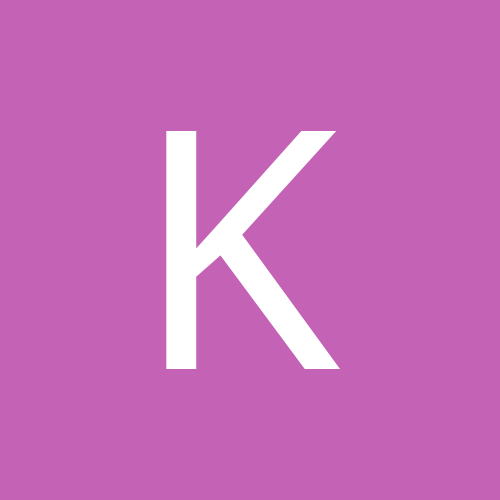 Please find attached example files. 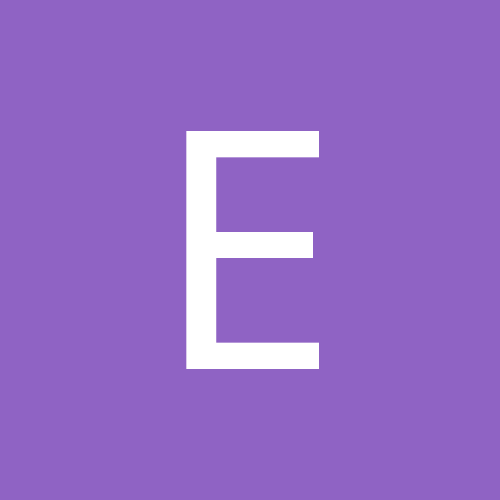 Extrude/extrude cut up to surface? Just offset the tire surface and use that. Or you could model a separate solid and use the Indent feature to cut the tire with it. You are trying to build your tire pattern in the wrong direction. Solidworks hates trying to build stuff off surfaces, especially curved surfaces like the round outer edge of your 'tire'. This is because Solidworks is a solids modeler, using breps and such, not a surface engine. Why? because for parametric dimension driving, solids are necessary. So, what you need to do is the following: Build one row of tire treads in what would be the width direction of the vehicle (across the tire) then pattern/array this row along the same profile you used to do the entire tire. you can do the initial row of treads in a couple of ways but the best way is to build them (extrude an loft after) on a plane that cross sections the tire in the vertical and across the width of the vehicle. As you extrude this first row of treads, you will need to make sure you start the sketch low enough that when extruding there is no gap between the bottom edge of the tread and the tire surface that is curving downwards. 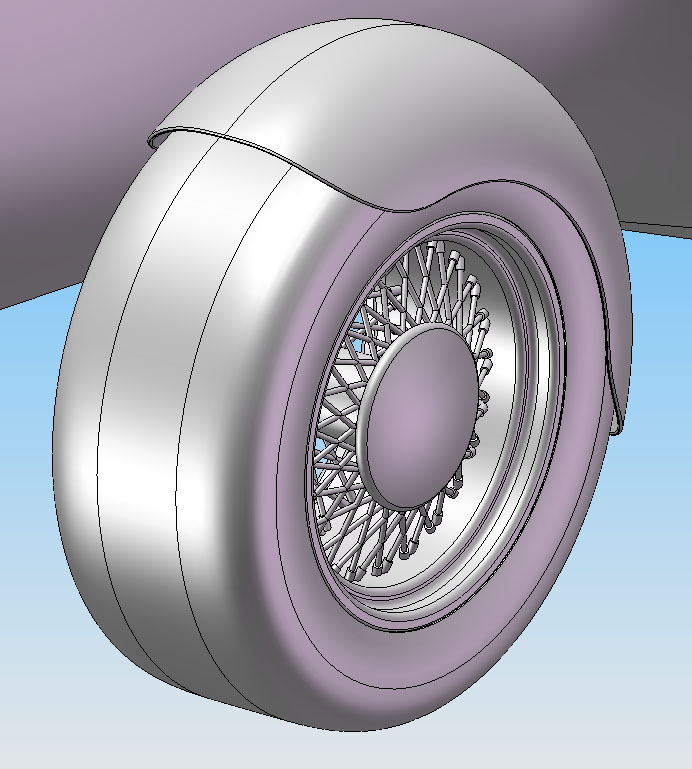 The center of the tread bottom will be below the surface of the tire, you couldcut (boolean/loft) away the top and bottom horizontal surfaces to match the tire curvature if you need to get fancy. 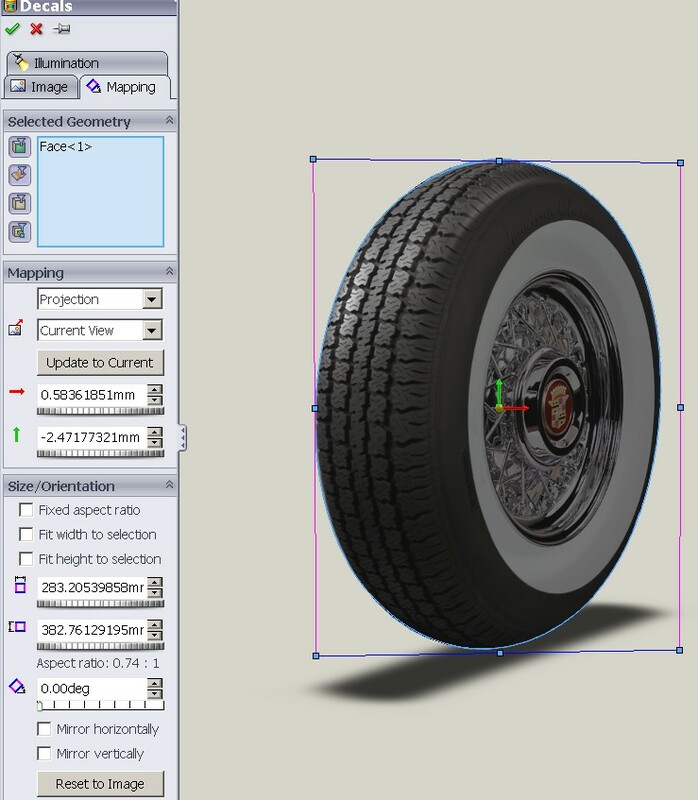 You could add relations between these profiles so that the tire surface and the tread top and bottom surfaces and pattern profiles changed together for parametric modeling. So the answer is to not build 'outwards' off of the surface, build one row of treads with a vertical sketch, extrude to get one row of treads in the width direction; and pattern/array along the same profile you used to loft/sweep the tire profile. If you need to curve the treads in the width direction of the tire at the edges, modify the initial sketch to curve with the tire edges in the width and vertical directions. Hopes this helps, if you need to see screenshots let me know, but I would have to load up solidworks again at home and I would rather avoid this. I think you might want to pick something a little less complex, SW is probably going to lock up with that much detail. If you look close at that pattern there are 3 or 4 different sized blocks in each row, 3 or 4 different rows, each block is complex, and then the sipes on top of that. That said I think the only way to do this would be with "wrap", closed sketch onto a face. Either calculate/measure the perimeter and draw the sketch that length or draw one section, wrap to face, and then a circular pattern. Again calculating the pattern to fit the circumference. On the taper on the sidewall maybe taper the sidewall fatter/thicker towards the rim, cut the pattern , then slice off the sidewall taper. the cut will follow the taper and the cut will look tapered when the sidewall is uniform thickness towards the rim. Also you need to try to get the tire surface to be just one face using a spline in your profile/rotate sketch of the tire body. Wrap will only go to one face at a time. not sure with solidwork, but catia or master cam would have been alot easier..
Dohh, nevermind, he's already posted to this thread, so apparently "mapping" is photo overlay, I only have the basic SW it doesn't allow photo mapping. Thank you for all your tips. Some of the pitfalls I'd already encountered was mentioned, and some of the strategies I thought of as well. Since my time is short, I chose to simply etch four lines into the tyre, like really, really old school style and leave it at that. The rims already have a lot of detail, while the car is pretty minimalistic, so I didn't want the wheels to distract the viewer too much. Here try this. This is how I would do it. I have actualy been thinking about it lately as well.